It was announced in 2007 that Wildcatter would be removed from the park for a brand new attraction: Tony Hawk’s Big Spin (now known as Pandemonium). Instead of a standard ride removal, Six Flags Over Texas decided to send Wildcatter out in style. On October 2, 2007 the ride was imploded and eventually scrapped. The video above shows multiple angles of the implosion. When Wildcatter was constructed in 1982 it was the first-ever Intamin Freefall attraction in the world, opening the same season as Freefall at Magic Mountain. This innovative technology quickly became a popular staple for many theme parks around the world. 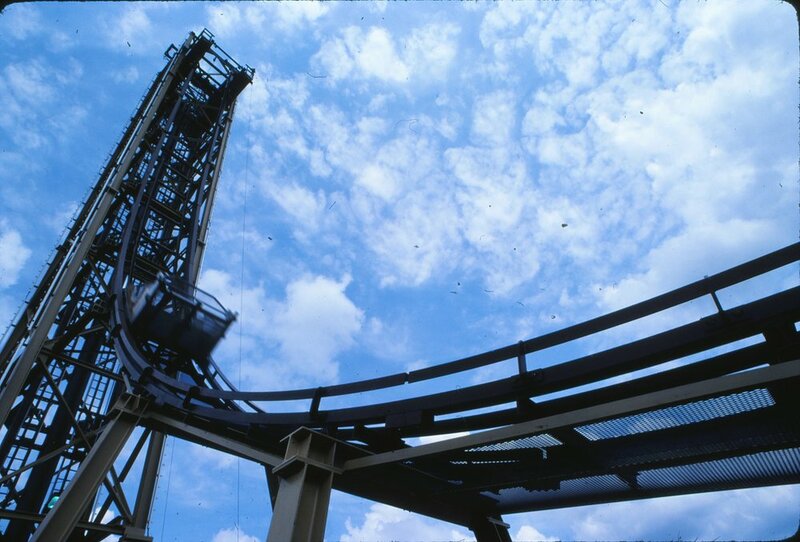 A total of 15 Intamin 1st-Generation Freefall attractions were installed in the USA, Canada, and Japan. While many new technological innovations have come to the amusement industry a few of these models are still standing. These first freefall attractions opened the door to a large number of unique vertical flat rides across the world. Intamin still designs and constructs many free-falling attractions. Built as the first-ever Intamin Freefall attraction in the world. Texas Cliffhanger is renamed G-Force.